Stickers often serve multipurpose products as a result company owners find different uses for decal stickers in our modern world. It is a fact that no matter where you go, sooner or later you will find yourself staring at one. Whether you find yourself at home, in a shopping mall or at work, stickers are absolutely everywhere. The need to differentiate yourself from your competitors using enhanced methods such as state-of-the-art decal stickers is a must nowadays, or else you won’t survive. It is very reassuring to know that there are still companies out there who offer various types of decals that can be used anywhere. Wall decal stickers are among the larger type that are placed on walls. Previously, wall paint was used to decorate your interior with. These days it is not uncommon to find a couple of decals on an office wall that resembles the taste of the CEO. In addition, they are far more reliable and durable as opposed to wallpaper. Best of all, there is no residue left behind once you’ve removed a decal sticker and replace it with another one. Window stickers are just as popular and are often found on shop windows as a promotional tool to advertise a brand or product with. These super strong stickers do not easily wear down or peel, regardless of the weather conditions, which makes it a viable option for business owners. The question is not so much where you choose to use your newly designed decal stickers, but which online printing company you decide to work with in making your stickers stand out from others. Besides, you want to transform your idle space into something useful that your future customers will surely notice. Companies like eStickers partner with you and help you attract eyeballs through well designed vinyl stickers, decals, murals as well as wall art in sticker form. Their graphic solutions are in place to produce an outstanding finish you can be proud of. This way, you get to brand your company’s personality the way it is meant to be. Your shop windows and/or vehicles can soon become powerful advertising and marketing tools thanks to super-creative decal stickers that will have your customers come back to you time and time again as they will regard you as an expert in your given field. What are you waiting for? Contact the experts and find out how decals can work for your business. Visit https://www.estickers.com.au right away. Stickers are among the most versatile items ever produced to promote organisations, causes, events and fun community events. The uses for stickers is something that the creative individual can effectively use in many different and unique ways around the office or at home. The use of stickers to name guests or delegates is a simple cost effective way in any event. This articles will investigate a few popular uses. Using stickers on the office or home calendar as reminders for important events is a nice method to prevent missing the event. Stickers for this application can be bought at local stations in a variety of fun shapes and colours. This easy method is great for keeping the home or office organised without using high technological gadgets. The use of stickers to decorate and beautify unsightly bins or containers is becoming extremely popular around offices and homes. The huge council garbage bins can be imaginatively covered by a large sticker designed for this application and create a unique custom look to the bin. Waste bins around the house or in children’s rooms is ideal applications for stickers to fit into the décor of the room. Children is the biggest lovers of stickers and huge stickers covering sections of the room in a cartoon scene will make this room unique. Nursery rooms is ideal to create a scene of serenity and calmness for the infant. Murals in many other applications around the business or even the surrounding walls of the company can attract attention and interest. A striking example is a dive shop where both the internal and external wall depict an underwater environment is product related and effective. 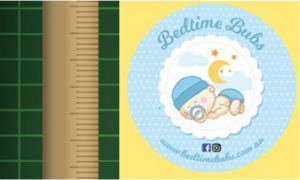 Some of these stickers are removable and could be reused and is a favourite at trade fairs and shows. Apple as a company has seen the sticker as a perfect advertising medium and the Apple logo is popular with its variants to make their products unique and different. The collectors has created a huge market for these stickers and will travel extensively to obtain a scarce sticker for their collection. Bumper and window stickers can allow the user to make personal statements about their views and preferences by displaying them on their cars or other vehicles. The sticker is widely seen and read by motorist following the vehicle. Interesting cartoon and messages will attract the required attention and comments. The use of stickers is versatile and with creativity and clever design can promote the message to a wide audience. To understand the difference between a sticker and a label we will look at how they are defined as to their respective functions and design characteristics. A sticker is always designed to portray a short message or logo and incorporates a design of applicable to the company using it. The label on the other hand contains information about a product or service and is usually part of the package or displayed on the article. The basic concept of stickers is that they normally have a solid colour as background and the material they are printed on can be peeled away to allow sticking to the object of choice. The material used for stickers can range from paper treated to withstand the elements and vinyl. The most famous of all stickers is the postage stamp used in every country around the world on a daily basis. The sticker is therefore a material that is sticky on the one side and the design or massage on the other side. They are designed in a magnitude of shapes, sizes and colours to suit the specific application ordered for. The collection of stickers has become a very popular and exciting hobby and creates a lot of serious interest. Scrapbooking as a hobby entails the use of stickers in various shapes, designs and colours in a specially design book. This has resulted in speciality stores or sections in existing stores carrying large varieties of stickers and supplies for the hobbyist. The use of stickers is a popular and inexpensive method to convey message to large numbers of the population. The use of stickers by political parties to promote their party and candidates is widely used in most countries. The use of these and other stickers has become popular in windows of vehicles. During major car racing events the amount of stickers placed on the vehicles and driver is considered extremely important for sponsors of the event. The sponsors of such events can invest millions in the promotion of their respective brands. Television and other media is able to display these prominent advertising method very effectively. This is possibly the most effective example of mass advertising using stickers. Some of the stickers used in this instance is highly valued by the collectors. 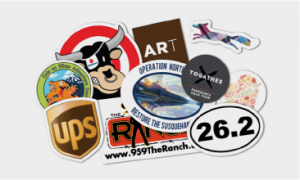 The concept of using stickers is available to all forms of advertising and promotion of products and services at the lowest possible financial input from the person using it. The task of creating advertising campaigns that is strong and powerful enough to carry the message into the market has become a daunting task for the modern business owner. The technology advantage of the invention of vinyl stickers eliminated some of the earlier disadvantages of paper backed stickers which was difficult to remove and left some residue behind. The vinyl type of stickers are also weather resistant which makes the use of this sticker much more durable and cost effective. The vinyl stickers can now be used outdoors and the use of stickers as an advertising medium is extremely effective. The motorist is basically forced to see and view the message displayed on the vehicle in front of him. Whether this message is a fun character or advertisement for some service offered by a company the impact is not lost on the reader. The time period that the message is displayed is also relative to the traffic pattern and thus the time that the message is viewed. The motorist will invariable read and possible even read it more than once. That makes the impression and presentation of the stickers important and could result in further enquiries of the product. The motor industry has gained a lot of prominence by sticking a vinyl display in the rear window displaying the name and location of the specific dealership and this resulted in increased sales for them. The cost factor to produce this extremely effective advertising method is low when compared to newspaper and television advertising. The results per dollar spend makes this the most effective advertising available anywhere in the world and therefore the preferred way to do outdoor advertising. The use of bumper stickers is also the first item on the agenda for any political candidate and political parties spend huge amounts from their funds to ensure adequate supply of bumper stickers available to their supporters. The effectiveness is again visible during election times when the candidate with the most appealing stickers take office. Creativity and proper planning of stickers will ensure that your product or service gets the attention it deserves. The various applications that stickers can be used for is absolutely endless and one you allow the creativity to flow more uses will be discovered. The design of a sticker is basically a message or design printed on preferably a vinyl surface that is sticky on the one side. Shapes and sizes can and will vary as to the specific needs or requirements of the company that it is designed for. Colours make the visual presentation of a stickers more eye catching as well as a striking logo or design. The broad concept of the ideology behind a sticker is promotion of a company or service and the identification or clarification of a product. Stickers are used worldwide in every industry and business. Price and product information and identification is vital in the modern business as the range of products is huge and the specifications of each product may be vital to its potential to sell. The motor industry and computer industry is striking examples of this need. Grocery store, supermarkets could not exist or compete if the use of stickers wasn’t available. There is a brisk trade among collectors for certain stickers and collectors will travel long distances and pay extreme amounts of cash to obtain a desirable sticker to complete a series or collection. The amount of collectable stickers used by a company such as Coca Cola over the years has resulted in many collectors competing with each other to obtain the limited amount of available item for their collections. The use of stickers has created support industries to make the use of stickers in certain applications more user friendly. Dispensers in which the stickers are housed is a perfect example and is widely used. Window stickers has evolved and has become extremely popular advertising numerous products, ideologies and interest of the owner. Scrapbooking has become a popular hobby over the past few years and involves stickers of a different design and purpose to be pasted in a book. The future of stickers will create new and exciting marketing ideas and we should see a lot of unique and interesting products in this field. Labels that are used for branding products, shipments, racking and marketing products are all Custom Labels. Even though these are mostly used for promotional purposes, they are often times used by electricians, plumbers and carpenters who need to label their equipment and tools. All that is required is to put the name of the product on the elegant custom label. Additionally, you can favour coasters and tags or create stunning party crafts in the form of cards or even bookplates. All these are remembered by those receiving them by the custom label attached to it. Another idea often used by business owners would be to hand out custom made coasters to their guests at special events. At e Stickers we let you make your pick from a large range of exclusively Crafted Custom Labels in a variety of shapes and colours. Furthermore, we assist you in terms of your choice of wording to ensure the wording you select matches the theme of your labels. Great pride is taken in assisting with the design, then printing and delivering the completed labels to its rightful owner. Labels appear literally everywhere and are seen on all sorts of products from beer and wine bottles to more personalised gifts such as wedding seals. Special wording and images are being used to convey the desired message to the recipient. Other practical applications, where you will often come across custom labels, may include coffee cups, hard hats, ID tags, truck doors and store front windows. The word customer implies that you can make the labels say whatever you want it to say. Various outlets, which include Pizza delivery services would utilise labels to serve as a temporary promotional tool to advertise their specials for a specific time period. Likewise, car dealers would make use of customised labels in the form of a decal at the back or front of their vehicles to serve as a temporary promotion. Schools and businesses may want to make use of a temporary parking permit, in which case a custom label would be just perfect. Even politicians love seeing their names on labels that are customised for the purpose of promoting them. It sure is a very affordable way of running a campaign. What are Custom Labels Made From? Usually, Custom Labels are made from either paper or vinyl and printed on rolls or sheets. What is more, the labels are super easy to attach to just about anything and very easy to remove as well. E Stickers makes use of the removable type so it can be used at a later stage. Sharp graphics and an array of colours ensure that the labels either provide a subtle message or a bold statement about the product or service on offer. E Stickers are experts in the business of custom labels, stickers, etc. They are an outstanding source of information in terms of anything to do with labels. You are encouraged to give them a call on 1300 97 98 99 to find out more.